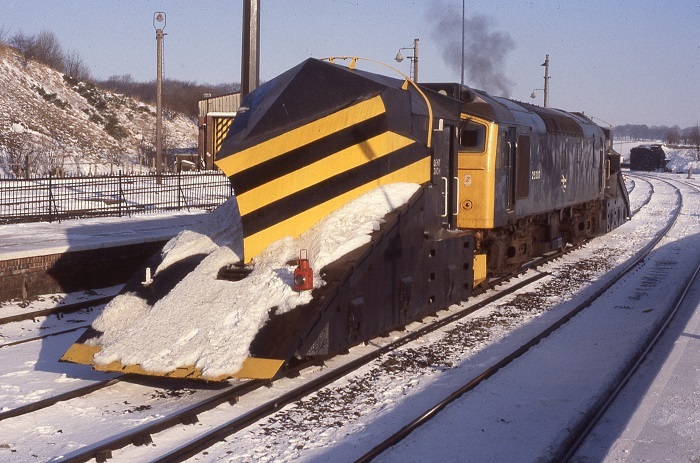 Photograph collection of webmaster A snowy day at Guide Bridge finds 25202 in charge of a train of limestone filled hoppers. The position of the number indicates a repair at Glasgow Works, although 25202 was never allocated to a Scottish Region depot. The twenty one year career of D7552/25202 was spent allocated to a variety of London Midland depots. Time between withdrawal and scrapping: 35 months. May 1968 to Allerton (8J), then to the Liverpool Division (D08). 25202 was the 287th Class 25 to be withdrawn, one of three retired during July 1986. After withdrawal 25202 was stored at Etches Park until moved to Stratford between June 19th - July 1st 1987 for brake rigging tests. It was then sent to Doncaster Works for scrapping via Peterborough (where it lingered for six weeks, departing September 10th) & March, reaching Doncaster towards the end of March 1988. Whilst at Doncaster it provided spare parts for 25912, including injectors. It remained at Doncaster until March 17th 1989 when it headed south to Vic Berry, Leicester, reaching the scrapyard on March 22nd 1989. 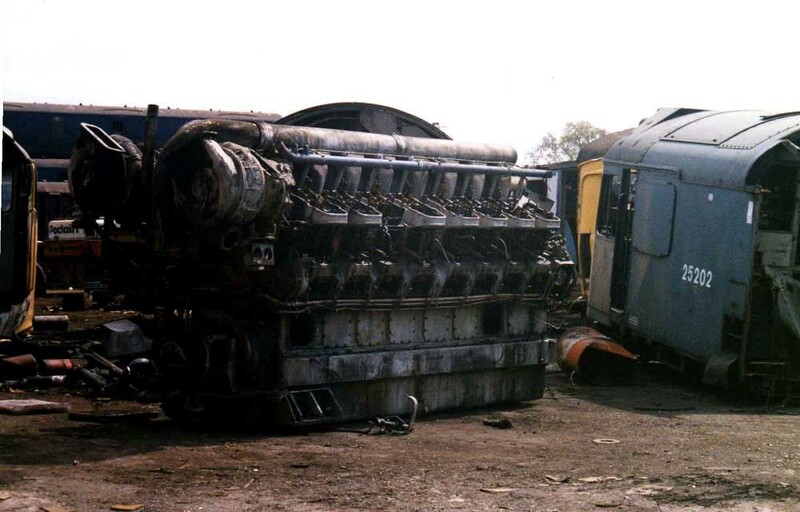 The locomotive was cut up slowly, being finally scrapped by the middle of June 1989. Noted Derby Works April - June 1974 (dual braking equipment fitted). Noted Glasgow Works May - July 1979 (Classified repair). 7552 worked a Nottingham - Lincoln parcels on January 22nd. Despite being allocated to Carlisle for thirteen years 25202 was an occasional visitor from the East Midlands to the east coast resorts between 1974 & 1977. 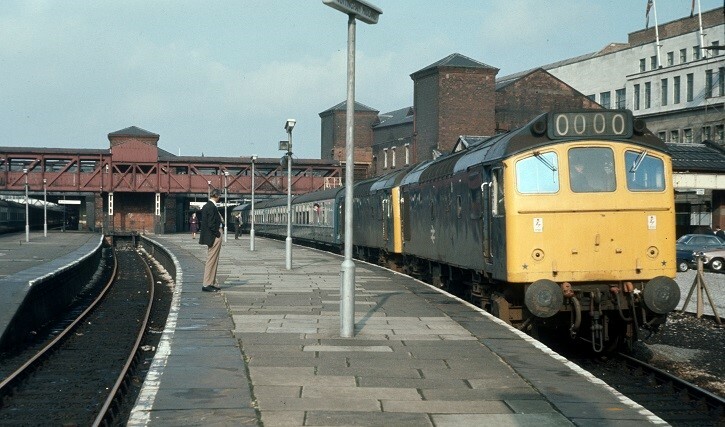 During June 1974 two round trips were made from Leicester to Skegness, on June 2nd & June 12th, both with 25317. On August 8th 25202 & 25214 worked a Stoke - Ipswich troop train. The next day (9th) the same pair worked the Walsall - Yarmouth - Derby diagram. The month of April saw the Widnes – Polmadie BOC working feature mixed pairs of locomotives including 25202 & 40135 on the 2nd. On September 7th 1976 25202 worked the 15.10 Cardiff - Crewe. During August 1977 25202 repeated its east coast visits. On August 20th it was on the Walsall - Yarmouth - Derby diagram with 25206, whilst the next day 25202 & 25200 worked the 08.40 Leicester - Skegness and 18.30 return. Photograph courtesy Bernard Mills. The 08.10 Derby - Yarmouth at Nottingham on August 20th 1977. 25202's only recorded passenger working in 1978 was on August 19th's 15.08 Cardiff - Crewe. If 25202 handled any passenger workings in 1979 & 1980 they have so far escaped reporting. A melancholy duty for 25202 & 25036 during October was their use with the ‘Rail Away Gang’ in the removal of the trackwork of the closed Rowrah – Whitehaven line. 25202 & 25325 were noted stabled at Wolverhampton on November 22nd. On June 6th 1981 25202 & 25207 worked the 10.10 Euston - Aberystwyth forward from Birmingham New Street, returning with the 18.00 Aberystwyth - Wolverhampton. Ten days later 25202 & 25206 worked a Birmingham New Street - Llandudno Town day excursion out and back from Crewe. 25175 & 25202 were stabled at Nuneaton station on February 13th. On February 28th the bitumen tanks arrived at Hereford behind 25202 & 25060 only to be delayed for twelve hours by trade union action, something which there seemed to be plenty of at this time. During 1982 25202 worked one round trip over the Cambrian line, on June 20th with 25186. The 12.35 Northfleet – Toton merry-go-round was worked by 25202 & 25206 on August 10th. 25202 & 25060 headed north through Crewe, off the Stoke line with mineral (sand?) wagons on August 16th. 25202 was noted at York on September 3rd. The next day (4th) 25202 was noted south/westbound at Derby during the evening with a parcels/passenger working. A Hall Road - Edge Hill ballast train was worked by 25202 & 25117 on December 5th. On February 26th 25202 & 25201 were noted at Crewe station light engines. On May 7th 1983 a Paddington – Bewdley special arrived behind 25236 (failed) & 25235, having taken over from 92220 ‘Evening Star’ at Dorridge, the return working being taken by 25202 & 25268 as far as Swindon, where 47508 took over for the return to Paddington. The following week an Open Day at Kidderminster Goods Yard included 25202 and 25067 (withdrawn) as well as Tyseley diesel multiple unit set TS417 along with a number of other exhibits. The displays were to publicize the service improvements between Worcester & Birmingham. Later in the same month, on May 17th 25202 rescued the 07.28 Hereford - Birmingham New Street, towing the diesel multiple unit from Stourbridge Junction to Langley Green. Three trips were made over the Cambrian line, on May 28th with 25212, June 4th with 25211 and on July 30th with 25119. On August 4th a special Ditton – Polmadie working used 25202 & 40131. On August 18th 25202 worked the 6E36 07.00 Holyhead RTZ Sidings - Humber Refinery petroleum coke empties. 25202 was stabled at Plomadie on September 11th. 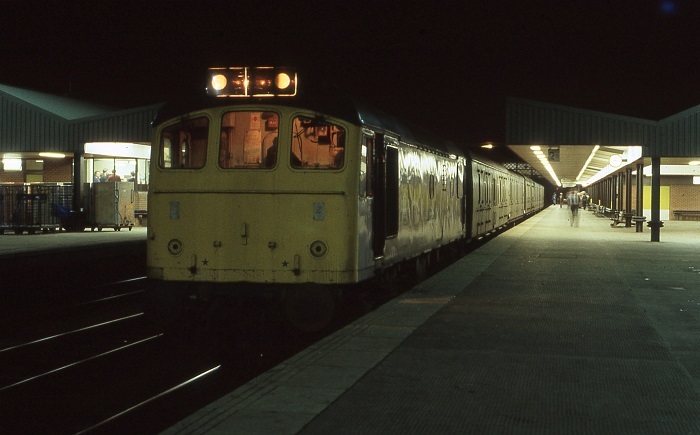 The last two passenger workings for 1983 took place on October 1st working the 07.10 Newcastle - Blackpool forward from Manchester Victoria, then working the 21.44 Preston - Liverpool. The Exeter - Ellesmere Port bitumen tanks were noted heavily delayed at Hereford on February 28th with 25202 & 25060, the deley being due to Trade Union half-day action. On March 9th 25202 worked the 18.05 Euston - Blackpool forward from Preston. 25202 & 25234 worked the 6Z97 Warsop to Stanlow oil tanks on March 29th. On April 7th 25202 worked a Barrow - Carlisle service following the failure of a diesel multiple unit. The ‘Easter Highlander’, a twelve hundred mile enthusiast railtour over the weekend of April 20th - 22nd provided typical ‘25’ haulage though of a mediocre nature. Diagrammed to handle the St Pancras - Derby portion the trip commenced behind 25042 & 25057, only for the latter to lose power almost immediately, becoming a total loss at St Albans. Heroic efforts by 25042 took the train to Bedford where 31118 was added for the run to Derby. On the return leg 25057 & 25202 were waiting at Derby to relieve 40028 for the run upto St. Pancras. All was not well with 25202 which expired, again at St Albans. Here the train was cancelled and the hapless excursionists transferred to a following service from Sheffield hauled by 45131. 25202 was noted southbound at Springs Branch with a mixed freight on April 26th. Passengers on a day excursion from Longport to Bath on May 19th started off with their diesel multiple unit requiring assistance from 25202 from Longport to Birmingham International. Here a replacement multiple unit was waiting for the day trippers. A week later (May 26th) 25202 & 25245 worked a round trip over the Cambrian line. On May 30th 25202 was noted at Manchester Victoria with a parcels working. 25202 was stabled at York on July 29th and at Gateshead the next day (30th). 25198 & 25202 were noted at Birkenhead Mollington Street with an engineers train on July 31st. On August 11th 25202 was noted at Carlisle station with two Research vehicles. On October 11th 25202 was noted at Undy with possibly the 18.10 Severn Tunnel Junction - Mossend freight. Photograph collection of webmaster 25202 at Leicester with a short parcels train, date unknown, but maybe 1984 or 1985. January 23rd saw 25202 venture into Scotland on the Willesden – Bathgate car train, later becoming a failure! 25202 was noted passing Flint with a lengthy train of 16ton mineral wagons on February 7th. On March 8th whilst on driver training duties 25202 failed near Wellingborough, blocking the down line for ninety minutes. 25202 was stabled at Severn Tunnel Junction on April 16th. When the 11.05 Hull - Lancaster failed at Carnforth on May 3rd, 25202 assisted the service to Lancaster, and then worked the return 15.52 Lancaster - Hull throughout. The next day (4th) 25202 was noted southbound with a freight through Clay Cross. 25202 was noted at Manchester Victoria on May 26th. On August 5th 1985 25202 again covered for a diesel multiple unit failure on a Barrow - Carlisle service. 25202 was stabled at Carlisle station on August 12th. Tyne Yard was host to two Class 25s on August 21st, 25109 took over the evening Parkeston – Mossend Speedlink whilst 25202 followed later that night with another Mossend bound service. Later in the same month, on August 27th 25202 worked the 15.45 Glasgow Central - Carlisle. The Manchester Victoria pilot was 25202 on September 6th. 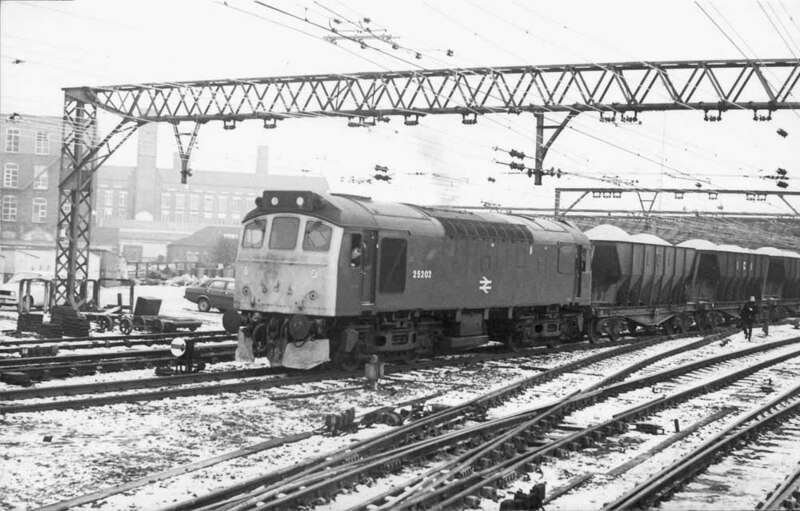 The first week of December saw the afternoon Manchester – Bristol parcels almost totally in the hands of the Class 25s, so noted were 25202 & 25192 on the 11th. 25202's final passenger working occurred on April 10th 1986 following a diesel multiple failure on a Blackburn - Manchester Victoria service. Services from Stanlow continued to see paired Class 25s, the Leeds tankers included 25201 & 25202 on April 18th and the same pair were noted westbound through Mancester Victoria with oil tanks on April 19th. 25202 was withdrawn on July 28th 1986. Photograph courtesy Michael Kaye. Looks like an English Electric 16 cylinder out of 50047 and to the right is 25202, well some of it. August 21st 1989. Page added February 26th 2013.